We have previously talked about websites, their several types, as well as Content Management Systems. If you have been following us from the very beginning, by now you must be eager to start building your website. Today, we’ll develop a simple website with HTML. Let’s start with a simple HTML page. We have already talked about HTML in our previous articles. Before we begin, however, we need to have a clear concept of how a web page looks like. We can break down the design into several sections, and each section can be separately modified and maintained. It helps us to develop web pages more efficiently. A typical web page can be considered to have five sections. It conveys information about the name of the website and is accompanied by a logo. Sometimes, it also contains a small description of the website. The header occupies the top of the page. The next section is known as the Nav-Bar or the Navigation Bar. It contains links to the important pages of a website for easy navigation. The Nav-Bar can be found below the header section of a web page. This is the part whose content generally differs across the web pages. It can span along the entire width of the page or up to some fixed width which is specified by the developer. The sidebar is an optional section of a web page that appears on the left or right side of the page and shares part of the total page width available. The sidebar is used for providing additional information and also to navigate quickly to various other pages. The footer appears at the bottom of the page and contains Copyright notices and links to legal Terms of Service and sometimes also Contact Information. Footers are constant throughout a website. Open up a text editor (eg. Notepad for Windows) and write the HTML code and save it with .html file extension. For now, you’ll create webpages on your local systems. Later on, you’ll see how to put the files on the server. Yes, this page is still not structured. The header should appear at the top of the page, spanning across the entire width followed by the Nav-Bar. The Main Body and the Sidebar should follow next, and the Footer should be at the bottom. What we need to do now is to define the boundaries for the individual sections that would tell the browser where to place them on the page. This is where style sheets are useful. A CSS (Cascading Style Sheets) file is a document that describes how the elements of an HTML page look like. In other words, a CSS defines the styling attributes of a web page and provides a proper structure. With CSS, you can define the position of an element, borders, color, and many more attributes. A proper CSS can make a simple web page look attractive. 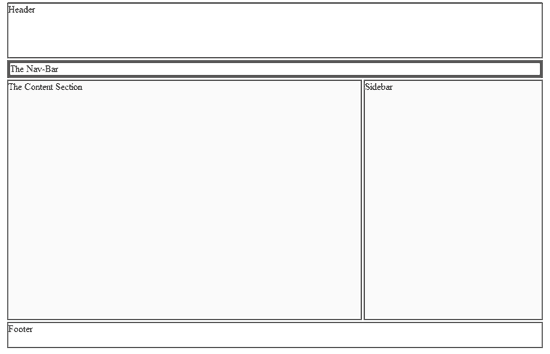 For example, the same web page we created looks like this when an appropriate style sheet is added. Here is the CSS code. Open up a new Notepad file, write the code, and save it with a .css extension. Keep it in the same directory as your HTML file. To link your CSS to your HTML, add the following line just before </head> in your HTML file. Styles can also be embedded directly within the HTML. Styles are then defined within the <style type=”text/css”> </style> tags.